Yep, there exists about 30 to 40 frame enlargements taken directly from the footage (in addition to actual production stills). I believe some still reside at the Lilly Library at Indiana University, but most of them are available for viewing at the University Of Michigan's Special Collections library (now holding the largest collection of Welles memorabilia). Not only do the images represent material cut from the initial 131 minute edit, but several of the images are of material presumably cut from the earlier 148 minute rough assembly. Welles had R.K.O. print these frame enlargements the second week of February, 1942 and ship them to him in Brazil; he used them as reference while he attempted to edit the film long distance through telegrams and phone messages to editor Robert Wise. Had Welles remained in Hollywood for the editing, I doubt these images would have been printed. I attended that screening, actually, and it looked great. Drucker wrote: A great read from years ago in Vanity Fair. There remains one, ever so slight possibility, and that is the workprint sent to Welles in Brazil. It apparently never got back. I believe there are records of a memo or directive ordering the print destroyed. The only hope then, is that someone disobeyed, and it's sitting in an archive somewhere. It's an extremely slim hope, but then again, they recovered nearly all of Metropolis, under circumstances far more fortuitous. It COULD happen. Just not very likely. Are there any stills/enlargements that haven't been reproduced in assorted books over the years? I seem to recall mention of a still of the final scene with Cotton leaving the boarding house and the city in the background. Is this true? Joe Buck wrote: Are there any stills/enlargements that haven't been reproduced in assorted books over the years? I seem to recall mention of a still of the final scene with Cotton leaving the boarding house and the city in the background. Is this true? Alas, a frame enlargement of that final matte shot does not appear to be in the archives. Joseph McBride told me that Bogdanovich showed him this image (among others) back in 1970, but no one seems to know what became of it in the years since. Bogdanovich said he returned all of the photos to Welles. They ended up being sold to the University of Michigan as part of a larger Welles collection, but the final matte image is not among the photos housed there. It could be misplaced elsewhere or in private hands. However, there are quite a few existing frame enlargements that have not been published. Notable images include Joseph Cotten's Eugene talking to his driver outside the factory (just before he visits the hospital and the boarding house) and a couple of POV shots where the camera is moving through the hallway of the rundown mansion (presumably these are taken from the subjective footage of George's last night in the Amberson house that Welles himself cut out when preparing the 131 minute edit). The last time I was at U-M I found a single negative image from the second porch scene footage showing Agnes Moorehead's Fanny in extreme foreground at the right and Richard Bennett's Major Amberson towards the left of frame, but further back. The camera was positioned so you could see autos passing on the street in the background. Joe Buck wrote: They ended up being sold to the University of Michigan as part of a larger Welles collection, but the final matte image is not among the photos housed there. It could be misplaced elsewhere or in private hands. I was just in Ann Arbor in August and had no idea there was an Orson Welles exhibit. What part of campus is it on!? The Welles material is housed in the Special Collections library which is on the seventh floor of the main Hatcher Library building located on the U-M Diag. The library has also acquired a large Robert Altman collection that I have not had the chance to look through. Don't know if anyone else has noticed this, as I've never read it pointed out, but if you look at the newspaper Eugene is holding before the last two (Freddie Fleck-directed) scenes, it has a great little joke with a stage review by none other than Jed Leland! Never noticed that before, but figured it's worth sharing, and certainly a great example of little in-jokes that Orson loved to plant in his films from time to time. Yup, it's a Kane paper - one of my favorite cinematic in-jokes. 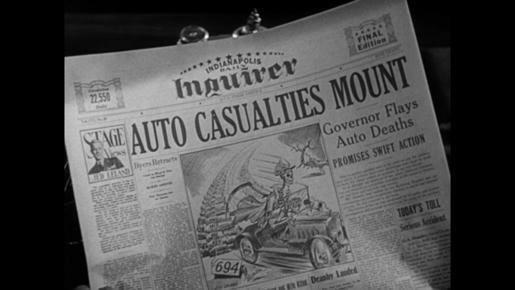 This insert shot of the newspaper was part of the re-shooting done after Welles left for South America; the paper's headline in the original footage was more hyperbolic (something like "AUTOS' BLOODY CARNAGE" which suited a Kane newspaper). I have no idea whether the "Indianapolis Inquirer" masthead or the "Jed Leland" column were part of the original insert shot or not. At any rate, it is a good in-joke and entirely accurate since the scene takes place circa 1910 when Jed Leland would have still been employed as the Inquirer's drama critic in the KANE universe. What is less likely is that a drama review column would be featured on the front page of the news section! What is also interesting about the paper is that the masthead contains the film's only reference to the name of the city where the story takes place (Tarkington avoided naming "Indianapolis" as the location in the novel even though it is fairly obvious this is the city he was writing about). Does this exist or is it my imagination? It exists. I am currently looking at a copy of it that is on one of the first few pages of Robert Carringer's book about Ambersons. I will admit I'm having trouble getting it to turn up in google images. Edit: There is a version of it here. Ah, nice! Thanks! I've read Carringer's book, so maybe that was where I saw it? "Just in time for Mother's Day, this edition of TCM's Greatest Classic Films Collection includes four movies featuring classic moms. 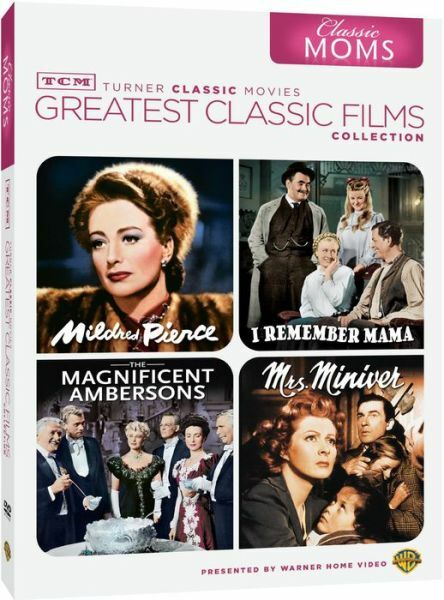 Included in this set are Mrs Miniver, Mildred Pierce, The Magnificent Ambersons, and I Remember Mama. Starring some of Hollywood's greatest legends, Joan Crawford, Irene Dunne, Agnes Moorehead, Greer Garson, and more!" What's next, a two-disc set pairing it with The Mexican Spitfire's Ghost? "See it the way it was meant to be seen!" Last edited by Fred Holywell on Sun Dec 02, 2018 8:28 pm, edited 3 times in total. Classic Moms who spoil their children so much that they grow up to be selfish, manipulative, greedy little monsters. Happy Mother's Day! The set has a split personality -- left side and right. Obviously, Welles was open to cutting the 131-minute cut from the start, and according to Carringer, everyone he talked to in Welles' camp who saw this long cut (which again wasn't even screened at any preview) and who believed it was a masterpiece all believed that it was not a final edit, specifically agreeing that it was too long, it wasn't tight enough from start to end and needed some trimming. So with that in mind, what would have been likely edits? Going through Carringer's book, I get the feeling the Pasadena cut (the second preview cut) comes closest. Again, it is much longer than the cut previewed at Pomona and more faithful to the original 131-minute cut. Most of the changes made between the Pomona and Pasadena cuts really involved reinstating footage that made the Pasadena cut more like the 131-minute cut. I actually don't think these were terrible moves. The first porch shores up George's resentment towards Eugene, which gives stronger motivation to his outburst in the next scene about cars being a nuisance. But it may have played poorly due to the potentially hokey device of George envisioning Lucy and fantasizing her renunciation of her father. I think this may have been the primary reason for cutting it given Wise's remarks, but the cut is also understandable because the scene would not have been a loss in terms of narrative or plot details. It doesn't introduce any new story elements into the film so much as build on pre-existing ones that were already expressed elsewhere. The second porch scene fills in plot details, but I think these were mostly investment plans that would go bad - they may have seemed dry and redundant in impact. Their crumbling fortunes are detailed thoroughly throughout the film, so it's not surprisingly that Wise would want to ditch it at this early stage. The remaining two scenes I would probably miss, and they are actually in the theatrical cut. They have also been trimmed for the theatrical cut - the factory visit still loses its last shot (or two?) when George and Lucy head off on a horse drawn carriage and the others in Eugene's latest car. In the bathroom scene with Jack, most of George's dialogue was also cut out. One other major change: George's long walk home and subsequent comeuppance (kneeling by the bed) is moved near the end, so that it becomes more or less the climax of the Ambersons' disintegration. I think this bit of restructuring is actually great. In the 131-minute cut, it came right after Jack and George part ways for the final time at the train station. So in the Pasadena cut, after Jack says goodbye to George, we go to Fanny's breakdown by the boiler (much of which was reshot for the theatrical release), George visiting Benson's office, THEN the long walk home, then the comeuppance, then the "Indian legend" scene with Lucy and Eugene, then George's accident….I get the impression this wasn't a dubious decision forced on the film, this was definitely something Wise strongly believed made the film flow better, and I don't get the impression Welles disagreed with it either. Beyond that, there were minor changes, probably to tighten up scenes. As described in Carringer's book, most of them come off as logical changes (eliminating redundancies, etc.) The only one that gives me pause is trimming the original final scene, but it's very possible that it was a little flabby in the 131-minute cut and needed a little tightening. It doesn't sound like any significant changes were really made to it. Anyway, if the 131-minute cut is truly lost forever, I guess the next best thing for me would be finding the Pasadena cut, and reinstating the two scenes that made it in the theatrical cut in shorter form. What's still missing may not be a great loss (and possibly an improvement, given the reasons and context in which they were cut), and at the very least moving the comeuppance scene gives it one edge over the original cut,. Regarding those Pasadena cuts, I noticed that you felt you'd miss the two scenes that ended up be reinstated in the released version, but not the ones you've never seen. Perhaps if we could see the two porch scenes we might treasure one or both as much as the factory visit and George and Jack's bathroom argument. My feeling is that the bathroom argument is great fun but quite dispensable. I feel the same way about the first porch scene (on paper) as much as I hate diminishing the beautiful "mirrored construction" of the 131 min. edit in which each scene in the film's first half has a twin in the second half that shows an ironic reversal. In this case, the "twin" second porch scene is the one that needed to stay in as the information regarding the Major's tax problems and the investment in the headlight company is crucial to understanding what bankrupts the family (and, seriously, Richard Bennett needs more scenes in this film). I have to disagree that it was a good move to push the "comeuppance" scene towards the end of the film. Having this scene immediately follow the deaths of Isabel and the Major, along with the news the family fortune is gone, allows the viewer to more readily recognize George's more sympathetic nature in his subsequent conversations with Fanny and Roger Bronson. The choice to move the "comeuppance" scene closer to the end of the film was actually Jack Moss' idea and he proposed it prior to the first preview (in fact, almost the entire structure for the released version was Moss' idea). Once the Pomona preview went sour, Moss started getting his way. Still, even though I disagree with the moving of this scene, I would be okay with that revision if they kept the "Indian Legend" scene just prior to George's accident - this sequence coming in after the train station scene completely wrecks the flow of the story. While the 131 min. edit sent to Welles in Brazil is presumed to be lost forever, we know that the Pasadena preview copy was most definitely destroyed...so I wouldn't get your hopes up with that (of course, in the post TOO MUCH JOHNSON-era who knows? ). *Something I just discovered this past Wednesday when I visited the Lilly Library collection: according to the daily production reports, Wise is credited as director for the March 10th, 1942 bedroom scene where George finds Isabel unconscious; however, the re-shot bedroom confrontation scene between George and Isabel that appears in the released version (shot on April 20th) shows Freddie Fleck credited as director (assistant director Fleck directs all of the re-shoots in quick succession in mid-April with only the "May 19th" Fanny boiler scene credited to Jack Moss). If you listen to Wise's later interviews, he always claims he directed a new bedroom scene to cover numerous scenes that had been cut out, but wouldn't that just apply to the situation with Welles' "big cut"? I'm thinking that the long-accepted claim that Wise directed the bedroom scene that appears in the released version is inaccurate; it was actually Fleck's work. In relation to Jack leaving and the conversation with Fanny, I would argue that placing the comeuppance scene after these events created a buildup to it that seemed more convincing. Placing it before them does create more motivation for those scenes, but a comeuppance to that degree is such a steep drop in one's ego, it feels more natural to me to have him beaten down more before really reaching that point. Placed after those scenes, the increasing isolation is even greater (not only is Jack gone, but before he leaves, Jack gives George another hit to the ego). And him weighing what's happened, what he needs to do, and throwing himself into what is a humbling decision, something like that feels like it would happen first before a comeuppance. Hard to put in words, but just witnessing things go bad isn't enough - finally taking some kind of decisive action on his own feels more convincing as a lead-in to the comeuppance. When Holt plays those scenes with Fanny and Roger Bronson in the film, he does indeed realize how grim things are, but there's some kind of determination there that pushes him to make that necessary sacrifice. To me, those things feel more appropriate before a mea culpa that signifies a broken man. Regardless, I didn't realize Moss pushed for it, though - I'm not that familiar with his role in Welles' organization, but a cursory search of his name seems to pull a lot of damning assessments. hearthesilence wrote: ...Regardless, I didn't realize Moss pushed for it, though - I'm not that familiar with his role in Welles' organization, but a cursory search of his name seems to pull a lot of damning assessments. One of the most interesting documents in the archives is a letter Robert Wise wrote to Welles on March 14th, 1942 just after he completed the 131 min. edit. Repeatedly in the letter Wise notes alterations that Moss is eager to make. Wise very deliberately makes a distinction between the changes Moss is asking for and his own suggestions, perhaps implying that he doesn't fully endorse Moss' ideas. Either way, Moss was Welles' business manager and should have been supporting his colleague, but even before the first previews he appeared ready to make more radical changes to the film than Wise himself. You make some fine points regarding the placement of the "comeuppance" scene. Again, while I prefer it coming after the train station scene (you implied in the above post that the "comeuppance" scene originally appeared before the train station farewell - it didn't), I wouldn't be too troubled with it coming later provided all the other scenes remained in the original sequencing. Ah, I misinterpreted something in your post. I should've referred back to my original post (which was written using the book as a guide), the scene always came after Jack's departure, regardless of the cut! Interesting to note: The Magnificent Ambersons, currently available here on the BBC Iplayer for the next thirteen days, appears to have been sourced from the most recent Warner disc, which was only ever part of the Citizen Kane Amazon Exclusive BD (currently £120 second hand on Amazon! ), so better quality than the old Region 2 Universal DVD, with superior blacks and detail, going by DVDBeaver's caps. Something to tide us over until Criterion release the film properly on BD. I can still remember catching this on 35mm at a double feature at Film Forum (for their Bernard Herrmann retrospective). Looked absolutely gorgeous, the print was in perfect condition but Stanley Cortez's photography just has to be seen from a good 35mm print. Such inky, deep blacks - you really understand why some believe Welles's own films for RKO had a huge hand in shaping the film noir aesthetic. It may be ignominious that Ambersons is included in a set with I Remember Mama, but hey, it's a good transfer, and a bargain to boot. Last edited by spoon99 on Wed Feb 28, 2018 6:40 pm, edited 1 time in total.